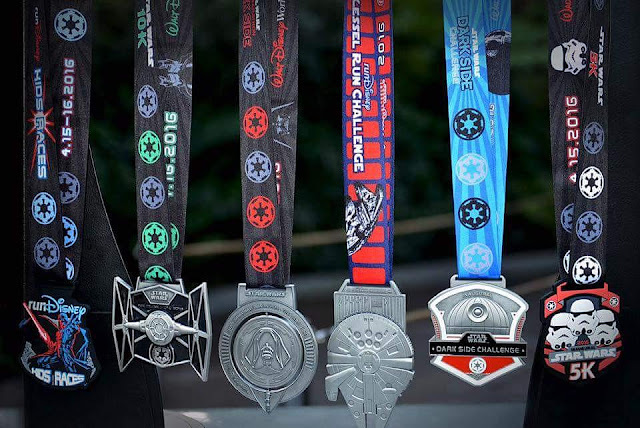 I've been waiting on this day since breaking down and registering for the runDisney Star Wars Dark Side Challenge a few months ago. I went through a few stages with this race series. It started with "I am not running it" (hopefully saving for runDisney Paris). Then that changed to "It's inaugural, I have to run at least the half so I have an inaugural medal". When it came time to register, I ended up going with the challenge, because you know - three medals are better than one. I will post higher quality photos once I receive it. I LOVE THESE MEDALS. I wish I signed up for the 5K (I can hear Amanda Tinney somewhere in Orlando saying "I told you so"). PS - The Star Wars Half Marathon - The Dark Side Half Marathon is still open for registration! Not for long after today's medal reveal happened.